Clear skies. Low near 45F. Winds SSW at 5 to 10 mph..
Clear skies. Low near 45F. Winds SSW at 5 to 10 mph. Upcoming meetings are food bank on the 4th at noon. Then on the 8th is the WBARD meeting at 7 p.m., followed by the City Council meeting on the 10th at 6 p.m. It looked like White Bird was well-represented at the Big Horn Show in Spokane. Homer Brown was up there and had all kinds of information, not only for his business, but various things to see and do in White Bird area. Thanks, Homer, for spending the weekend up there. A DIY Sign Class is being presented by the Hydrant on Saturday, March 30, at 6 p.m. Choose your own design and pricing will depend on the size of sign. For information call 208-839-9993. Also taking place on the 30th is the 100th Birthday Celebration of the American Legion Grangeville Post 37. This will be held at the Grangeville Elks Lodge with the social hour starting at 5 p.m. Everyone 21 and older is welcomed. Dinner is at 6 p.m., with tickets going for $30/single or $50/couple. There is a discount for current members. Live music being provided by Verna, Joaquin & Dave beginning at 7 p.m.; $10 cover charge without dinner at 7 p.m. Many auction items, prizes and raffles. Tickets available at the Veterans Center, Grangeville or you can call 208-983-9387. Mark your calendars for the White Bird Gun Club Turkey Shoot. Rifle shoot will be Saturday, April 13, with sign-in and shoot starts at 8 a.m. (Pacific time). Now only $1/entry fee for each relay! Prizes for 1st thru 4th places in each relay. Hamburgers and soft drinks will be available, and we can loan you a gun if you don't bring your own. For information, call Dave at 208-628-3759. This event is sponsored by the White Bird Gun Club, Ray Holes Saddle Company and Rocky Mountain Welding of Wendell, Idaho. White Bird Days announces that the grand marshals will be Mike and Marlene Heath. They were some of the founding members who helped get the rodeo started. More information to follow. The parade theme is "My Heroes have always been Cowboys," and parade entries will be taken by Barb Lowe; call her at 208-839-2444 for entry forms or to get entered! Let your imagination run wild! The 2019 Rodeo Queen is Kaylee Page of Kooskia. Her parents are Phyllis and Yogi Page. Stay tuned for more information on these people. Pinochle winner was Smiley. Cribbage winner was Jill. Birthday wishes go out to Jessica Schacher, Marshall Roemer, Jacob Collier, Sam Zbinden, Clayton Black (1st), Payje Sickels (3rd), Connie Schuck, Shaun Bass, Ryder Schacher (5th), Kate Buck (6th). In Memory of Tom Jones (1st), Leo Pils (3rd), Bill Smurthwaite (6th). Anniversary wishes go out to Jerry & April Brown (2nd), Bob & Edith McKnight (4th) and Clint & Nikki Sickels (5th). TidBits: Hope everyone is enjoying spring break! Here is a great job for anyone who may want to apply...2020 Census Takers. Idaho County area, pay is $13.50 to$15/hour, apply online at 2020census.gov/jobs. It provides great pay, flexible hours, weekly pay and paid training. For information or help applying call 1-855-562-2020. I did this in 2010 and loved it. My area was Elk City and boy did I get to meet some colorful people! 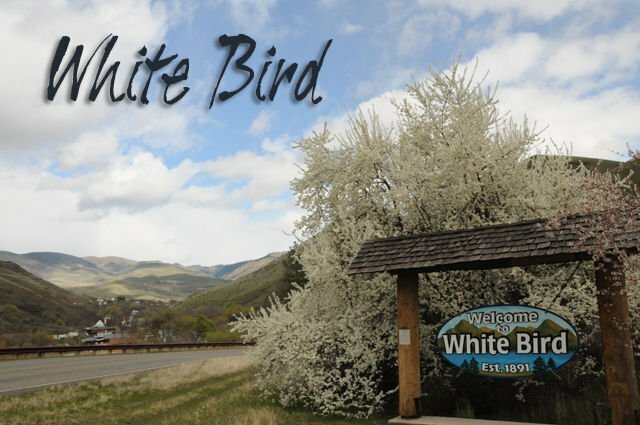 WHITE BIRD – Our year started off with a bang! We have a lot of groups using our two rooms: Health class, QRU, fire class, Salmon River Art Guild (SRAG). SRAG had a great turnout for its March Madness Artisan and Art Show, selling more than any other year! Next, they have set several two-day workshops with Larry Ferguson May 10 and 11, and Aaron Johnson June 1 and 2. Our Sunday morning breakfasts are bringing people out for old-fashioned community visiting and good food. The food bank will be setting up in the WBARD parking lot each month. There will be a plant exchange party April 27, so bring your extra houseplants, herbs and yard and flowering plants to exchange. If any vendors or crafts people would like to set up a table, there will be a $5 charge.